Jim Younkins is a three dimensional artist. Whenever someone needs to create or improve the appearance or design of a module they almost always land in Jim's basement in Olympia. The cover pages of national model magazines have been graced with photos of Jim's handiwork. The N Scale Magazine (March/April 2001) has a cover story on his home layout showing Bordeaux Yard , Engine Facility & Junction, which is the central part of the Mud Bay & Southern Railway. Jim is an inspiration to people around him from seasoned modelers to beginners. He has that uncanny ability to amaze you by taking a pile of stuff (not always junk) and turning it into "just the right thing for that spot." He blends things together with that artist's eye creating a very prototypical appearing scene. With all the different areas of Jim's interests in modeling the one that always stands out on his modules or home layout is attention to details. This is really evident with Jim's model vehicles. The following gallery includes Jim's former module inventory. The MB&S sawmill (8 foot), Mudville (4 foot corner) and cement module (4 foot straight). Enjoy. Most of the items on the former modules are now part of his home layout. Jim still has a two foot module used in shows and has built a new corner and 6 foot straight module, shown below. 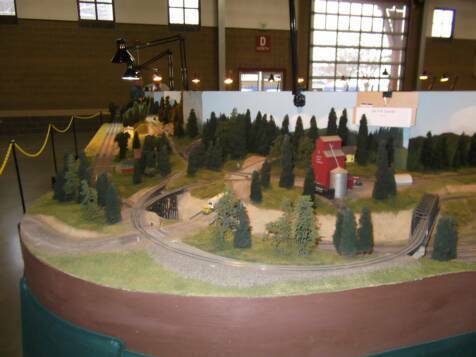 This picture shows the 6 foot module with a silo on the right end and a small yard on the left end plus a branch track leading up to the corner connecting to the mountain line. 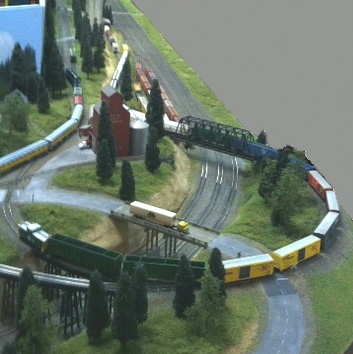 The corner module has a grain silo and the circle track connecting the branch line and mountain line together. The 3 main lines go through a cut in the middle of the module. 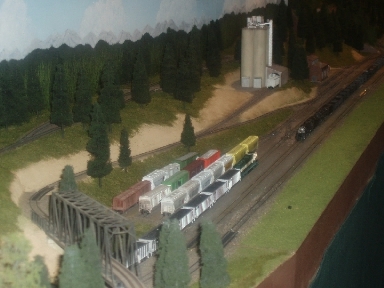 This view of the corner shows the train coming up the branch track on the 6 foot module and circling around to the mountain line track.